The Kenai Peninsula's Premier Professional Fishing Guide Service with the finest freshwater and saltwater fishing experiences Alaska has to offer! 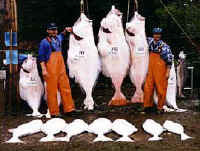 Ninilchik Saltwater Charters and Lodge is located in a beautiful little Russian fishing village called Ninilchik, which sits on the shores of Cook Inlet in the Heart of the famous Kenai Peninsula, known as Alaska's playground. Ninilchik's picturesque beauty, Native and Russian history, and abundant wildlife will captivate and intrigue you. Come aboard one of our two fully equipped 28 foot Kofflers on the beautiful Cook Inlet. We're sure you will have an experience of a lifetime. Greatland Guide Service gives you the opportunity to boat fish in excess of 300 lbs. from the beautiful waters of Cook Inlet.